As usual I've had a lot going on around here, so I ended up pulling another all nighter to get this piece finished. I'll probably make a pair of earrings with what's leftover, but my bed beckoned and by two this morning it was just about yelling at me. The ideas for this necklace went through several idea stages. One failed completely. I'd intended tying beads onto cord, but all the cord I had was too thick for several of the beads. I had a mad, messy idea, but that couldn't happen, in particular because of the cord thickness problem and no shops open in the middle of the night. I love it! It looks like a necklace of your favorite treasures! The all-nighter really paid off. wow heather, this necklace is really beautiful !!! I wish all nighters would produce beauties like that for me! I love the additions you made to the kit. The blue really pops. That sweet little bird in the dangles is perfect. Great job! I like the blue too! and my favorite part is how you added the acorn upside down with the leaf dangle! Great work. This is so cool! I love how all the components you used fit so well together and how the colors look fabulous!! I love the way you went in a totally different direction than what I have seen so far. The addition of the blue really brightens it up. Love all the chains, too. It is beautiful!! I also love the blue! GORGEOUS!! I love it when jewelry makes the clinky noises too-have fun wearing this! Lovely necklace! I like that you added blue beads, creating a very pretty colour combo. And I like seeing how the participants -- those I've visited so far -- have focused on different colours. beautiful and vibrant! The blues really brighten the piece. I am intrigued by the addition of the blue in your design. That was something that never occurred to me. I love how the blue brightens up the piece and how the other colors accent it beautifully. What a lovely necklace! Will look great with anything! Beautiful necklace! I like things that make noise when you wear them too :) And that little bird charm? Darling! As is that heart charm! I agree with some of the previous comments. I love the addition of the blue (I actually said "oooooh blue" out loud - at work). Your lack of sleep really paid off! The blue just makes it pop! And I love the charm-y focal, very nice! 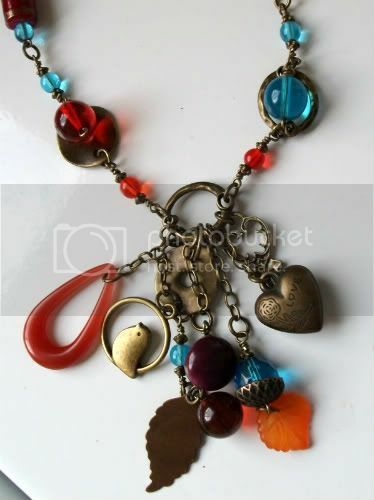 I love the colors and all the beautiful charms! Like Cyndi, I love noisy jewelry too! What a terrific piece, with so much movement and great colors! I loved this! Great job putting together such a wonderful project. 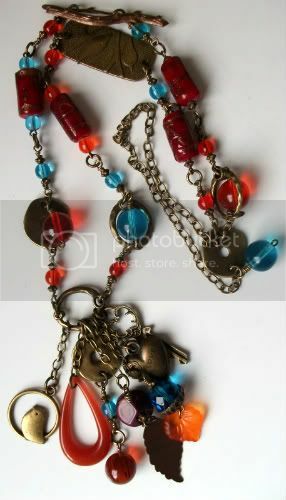 What fun, it is like a charm necklace and I bet it makes a great sound while wearing it, the color combo is wonderful! 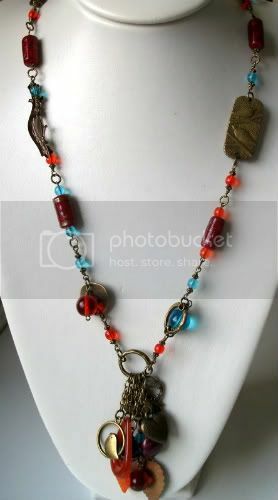 Love the cluster style of necklace, and the inclusion of the blue beads brightens it up beautifully. How fun! I love this charm-style necklace, especially now that I know it makes noise as you move. I'm inspired to make one myself! I like the blue touches you added. I never would have thought about doing that! Hope to see you in a future challenge!